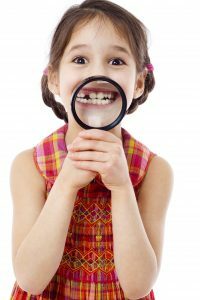 Preventing tooth decay is absolutely essential, especially for kids. Because children can have a hard time explaining a toothache, tooth decay is often left untreated—which can make it hard for your child to eat and talk properly. Fortunately, you can help protect your child from tooth decay by having dental sealants applied to their teeth. Dental sealants are made from non-toxic plastic that is painted directly onto the molars. Sealants are completely clear and not noticeable, allowing your child to smile with confidence. Sealants are designed to act as a barrier between your child’s natural tooth surface and the food particles and acids in their mouth, protecting their teeth from decay. If you are worried about subjecting your child to a difficult dental procedure, you shouldn’t be. Dental sealants are easy to apply and well tolerated by children. After the teeth are treated for underlying problems, they are cleaned, flossed, and polished carefully. Next, a mild etching solution is painted onto the teeth to improve adhesion between the tooth and the sealant. After about 15 seconds, this compound is cleaned off of the teeth, and the sealant is dropped or painted onto the teeth. Sealants cure in seconds with a gentle handheld UV light, and children can eat and talk normally immediately following the procedure. There is a reason that Hines Little Smiles and other Columbus pediatric dentistry practices swear by dental sealants for children. In addition to reducing the risk of cavities in molars by a staggering 80%, dental sealants are also capable of lasting as long as 10 years. Sealant material also helps to smooth out biting surfaces, making brushing and flossing easier and preventing plaque and tartar accumulation. Also, since most dental insurance companies cover the cost of dental sealants as a preventive care measure, they are incredibly affordable and cost effective. For more information about scheduling an appointment for your child to receive dental sealants, make an appointment with Hines Little Smiles today. Our entire office is dedicated to making dentistry a fun, happy place for kids of all ages. Contact us today to schedule an appointment for your little one.